Rob, based in the south east, has been a lover of the great outdoors for many years, having commenced walking and scrambling in the British Mountains as a teenager. He has been climbing since the mid 70’s, his first experience on ‘real’ rock being Harrison’s Rocks in the south-east. Eventually the lure of more adventurous locations took a hold and a whole new world of mountain routes and sea cliffs opened up. Rob has been a regular visitor to the Alps since 1986 and climbed in the US for the first time in ’98, climbing in Colorado, Wyoming, Utah and California on various trips. Over the last four years Rob has visited Morocco's Anti-Atlas Mountains, embracing the very adventurous trad climbing in the most stunning of settings! 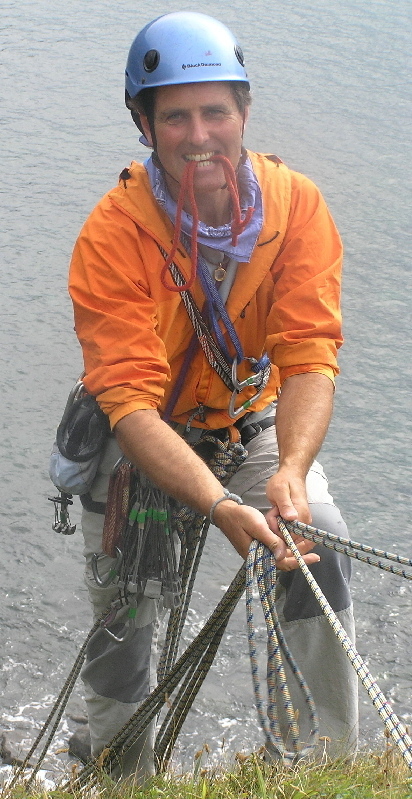 On the instructing front Rob has been passing on rock climbing and mountaineering skills for over 20 years. He has held the Mountain Instructor Award, since 2002. Rob is a member of the Association of Mountaineering Instructors (AMI). Other interests include; mountain biking, orienteering and skiing. Touch the Rock delivers climbing and mountaineering courses in the UK and the Costa Blanca area of Spain. We also facilitate Alpine and Ice climbing courses in France, Italy and Switzerland. Living in Brighton, East Sussex, Rob is able to provide personal tuition for climbers of all levels at local climbing walls and runs rock courses on the Southern Sandstone. Espolon Paigu, Cabezon De Oro, Through the looking glass, Echo 2, Diedro Edwards, The Divino.